This was my first try recipe using my new Instant Pot and it was a success. It is a good recipe, and I will make it again. I like more seasoning in beef stew and will add more the next time I make it. I took Josh’s advice and wrapped the potatoes and carrots in foil and placed them on the rack after putting the liquid and other items in the Instant Pot. The vegetables came out perfectly cooked and the meat was tender. I should have added salt and pepper and maybe some garlic powder to the foil packets of potatoes and carrots and will do that next time. Like a previous reviewer, I also added double the amount of corn starch and water at the end to thicken the stew. For me, the total time given for this recipe was understated. It took me over 1-1/2 hours. Keeping in mind that this was my first try using the Instant Pot so I was being extra careful and referring to the manual as I cooked, the prep for this dish took me more like 30 minutes rather than 15 including both vegetable prep and sauteing the meat. The total time given for the recipe doesn’t include the time it takes to bring the IP to high pressure. That adds about 15 to 20 minutes. After that, the 35 minutes to cook and the 10 minutes to naturally release are accurate. Wow this was delicious!!! My family thanks you for the yummy recipe!! I took Josh’s advice too and wrapped the potatoes and carrots in the foil….veggies came out perfectly! This one was a definite hit ?????? I don’t like tomato sauce so what can I use instead for liquid at that time of putting the sauce in. More beef broth? I didn’t have tomato sauce so I used pasta sauce … and it was great. I think you can also use a can of diced tomatoes. My first Instant Pot dish. Amazing! Used 4 T cornstarch, thickened perfectly for my liking. Will definitely make again! Made this for first time tonight. 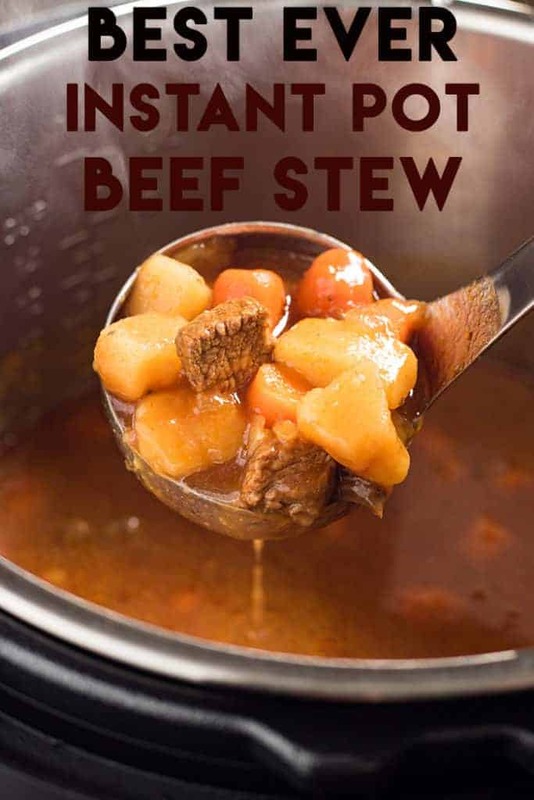 My hubby loves beef stew but I’ve never found a recipe I liked that much…before now. This was delicious. Hubby raved about it. Only change I made was to double the corn starch/water mix at the end. Personal preference is for a little thicker stew. The hubby also requested I throw in an extra potato or two next time but the flavor was marvelous as is. First time making this and happy with how it turned out. I was really nervous about the veggies being in too long so instead I did everything the same for the 35 min (except left out the veggies), but then did a QR and added my veggies. Turned it back on high pressure for 6 min with 10 NR and the veggies are PERFECT. Love it. This definitely increased over all cooking time though. Very delicious! Definitely the best beef stew I’ve ever eaten. This was a great stew! For an added level of flavor, I added allspice! Yum! I substitute sweet potatoes for white potatoes with roast beef and stew. Wonderful pairing. I am very new to the instant pot world (got mine for Christmas) so this may seem like a silly question to veterans but do I cook this on manual or the stew/soup option? If I don’t have an instant pot, how long should I cook on stovetop or in a crockpot? Just wow! 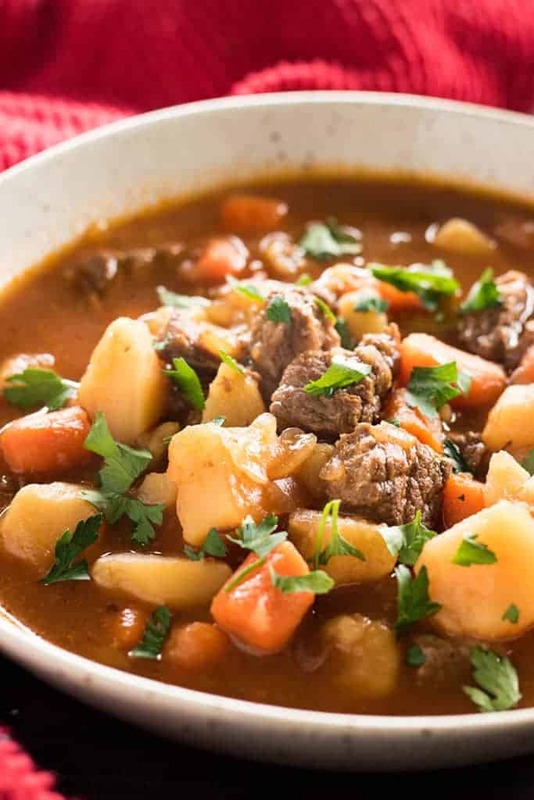 My husband and I are absolutely in love with this beef stew! Thank you so much for sharing the recipe! Made this recipe tonight and was very satisfied with it. I followed the recipe as is and it turned out really good. My husband normally makes the stew in our house. He was quite happy with it and said that he even likes it better than his recipe?! Thanks for sharing! Just gave this a whirl in my new Duo Mini. With some “single guy” modifications. I browned the stew meat with garlic and onions. Threw in a can of Progresso ready-to-eat Beef and Barley soup. Added another half can of water to make it look right. Carrots and potatoes cut to about 1 inch chunks. Some more onions. High Pressure for 35 minutes. Waited 10-12 minutes.. then released the pressure. I did add a little corn starch and water to give it a good thickness. And then burned my tongue because… well single guy.. hungry.. Came out really well. I need to work on the spices a little, but that said… I’m on my second bowl. Mike you sound resourceful and adorable. Good luck trying out new recipes in your instant pot. My fav is meatlof and potatoes…so easy. When would you add barley if you were adding it? Made is as very first thing I made in my new instant pot. It was delicious everyone family loved it. 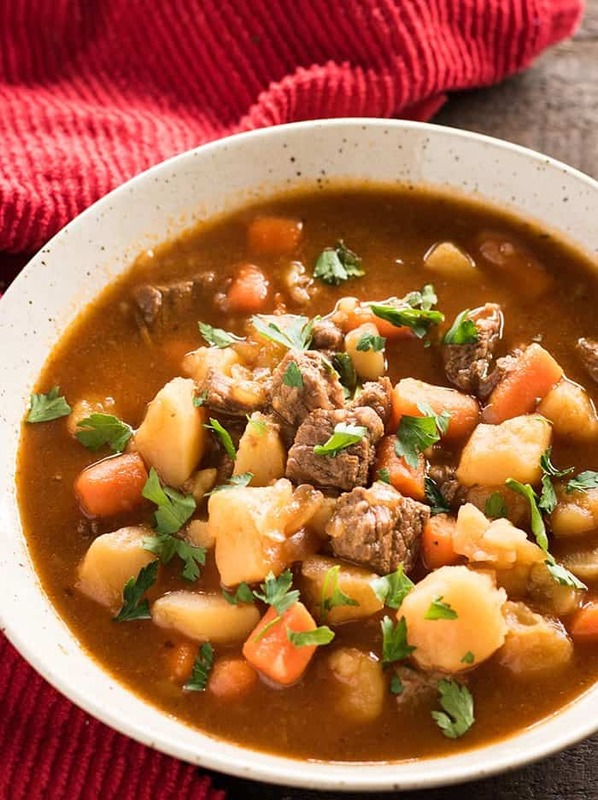 First time making this, and I didn’t know my wife didn’t like beef stew…but she LOVED this! Based on the comments above, instead of tomato sauce, I used diced tomatoes with chiles instead of tomato sauce, and it really added a nice kick to everything! Great recipe!